"SOUTH PARK: BIGGER, LONGER & UNCUT"
Funnier than the show at its very best, but won't be quite as much fun without an audience full of shocked fellow patrons howling uncontrolably with you. That's not discoragement, though. This is a 100% keeper. "South Park: Bigger, Longer and Uncut" just can't wait to wiggle out of the restraints put on its television counterpart. In the first 10 minutes of the movie, the cartoon's creators go out of their way to assure an R-rating as quickly as possible with a mock-Broadway musical number of flatulence and profanity that culminates in a chorus that goes "Shut your f***ing face, uncle f***er..." to a tune so peppy you almost can't help but sing along. As shamefully funny as "There's Something About Mary" and at least twice as crude, this latest big screen TV transplant is tasteless, raw and offensive to be sure. But by the time that opening showtune was over, I was laughing so hard I could hardly breathe. And it only gets funnier. 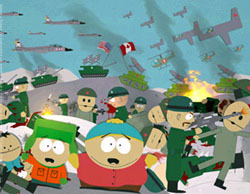 A surprisingly astute social satire that takes ruthless aim at everything from parental responsibility to Saddam Hussein, "South Park" starts simply enough with the badly-animated and already foul-mouthed "South Park" kids -- Stan, Kyle, Cartman and Kenny -- sneaking in to an R-rated movie and coming home cursing like sailors. Looking for someone to wag their fingers at, the kids' parents, rallying around a McCarthyism-themed showtune of their own, decide to blame Canada for all the offensive entertainment warping the minds of American children. They quickly garner enough political clout to start a full-scale war. Parodying the Sunday school lesson style of early Disney musicals with many corny tender moments and even cornier incidental music -- as if the soundtrack from the original "Parent Trap" got lost in the multiplex and wandered into the wrong theater -- "South Park" creators Trey Parker and Matt Stone take aim at everyone and everything in this movie, starting with themselves and the censors that have become the arch-nemeses of the TV show. Besides Canadians, finger-pointing parents, censorship-happy politicians, targets include the MPAA ratings board, Christians, Jews, Hindus, Blacks and gays, the Baldwins, movie producers, Satan and Saddam Hussein (who are portrayed as gay lovers), the V-chip (here re-engineered as implants that gives kids electric shocks when they swear), Brian Boitano, Disney musicals, "Star Wars" (they even added a Jar Jar Binks joke at the last minute), Bill Gates, "Men Are From Mars, Women Are From Venus," "Patton," "Star Trek 2," and even God. Amazingly, with all that going on, not one gag misfires, although the movie does lose momentum for a couple reels in the middle after Kenny, who dies in every episode of the show, goes to hell and counsels Satan on his self-esteem. Obviously, this is not a movie for the easily offended. In fact, it might not be a movie for anyone but the show's fans. But if you count yourself in that group, you will laugh harder at "Bigger, Longer and Uncut" than you've laughed at every "South Park" episode put together.